South Africa narrowly averted a mutiny by soldiers loyal to former president Jacob Zuma on the eve of his forced resignation in February. Highly placed sources within the security forces and ANC leadership told City Press that military intelligence picked up on talk of a revolt among soldiers who were former members of the ANC’s Umkhonto weSizwe. President Cyril Ramaphosa – then ANC president and deputy head of state – was warned to resolve the standoff with Zuma because it was likely to cause instability if it dragged on. The army chiefs were also wary that Zuma’s popularity among his former Umkhonto weSizwe comrades was being exploited to mobilise sympathy among the forces. Senior military leaders played down the threat this week, saying the top brass would not have tolerated a mutiny, that they were “above petty party politics” and the idea of keeping Zuma in power by force did not even arise. They insisted the army was loyal to the Constitution and that the chief of the army, General Solly Shoke, had continuously championed this. “When Ramaphosa spoke of a bloodless leadership change [at an army event in Kimberley four days after his inauguration], it was in contrast to the situation in Zimbabwe,” said one military commander. SA National Defence Force (SANDF) insiders said ANC elements who wanted to advance their factional interests were trying to use the military as a proxy in their political battles, but it would not succeed. “The idea is that if you weaken the security forces and especially the army, you have weakened government,” said another. Fringe groups such as the MK Inkululeko Foundation, which was one of Zuma’s fiercest defenders, had launched a “Hands off Zuma” campaign, and spoke of a civil war if Zuma was not allowed to complete his term and remain in office until next year’s general election. Zuma also enjoyed significant support in the Umkhonto weSizwe Military Veterans’ Association, which comprises the ANC's former liberation soldiers. However, Zuma’s lieutenants said he was the hero because his decision to resign saved Ramaphosa the embarrassment of being rejected by the military. “Remember, Cyril is just a civilian, so the military would not recognise him in the same way as Zuma,” said a close aide. One Zuma lieutenant warned that Ramaphosa was again “meddling” in the affairs of very powerful people in the security cluster through his appointment of a high-level review panel on the State Security Agency, which could spell similar trouble for him. “Those guys will not be happy to have him suddenly saying he is re-vetting them and all those things, and they could bring down his government,” he said. Ramaphosa allies confirmed the military threat, but added that generals loyal to Zuma tried to push the agenda, but were defied by the rank and file. A senior member of the ANC alliance said that, aside from a military revolt, they also learnt that Zuma intended to fire Ramaphosa as deputy president in a snap Cabinet reshuffle as part of his fight-back plan. The alliance insider confirmed meetings with army officials, adding that the State Security Agency was also lobbied to revolt, but all plots were foiled. However, Zuma’s allies mentioned former security agency director-general Arthur Fraser as one of those who worked behind the scenes to prevent the crisis.However, Zuma’s allies mentioned former security agency director-general Arthur Fraser as one of those who worked behind the scenes to prevent the crisis.However, Zuma’s allies mentioned former security agency director-general Arthur Fraser as one of those who worked behind the scenes to prevent the crisis.However, Zuma’s allies mentioned former security agency director-general Arthur Fraser as one of those who worked behind the scenes to prevent the crisis.However, Zuma’s allies mentioned former security agency director-general Arthur Fraser as one of those who worked behind the scenes to prevent the crisis. He said Zuma should also be credited with having the wisdom to see “it would not work out”, after which he “ended up hanging up his gloves”. An ANC MP said they had “heard that Zuma was planning to declare a state of emergency, and cordon off the parliamentary precinct and arrest MPs on the day he gave an exclusive interview to the SABC”. “Apparently, this plan was foiled when the generals below the army chief indicated their loyalty to the Constitution,” the MP said. But the army brass said the state of emergency claims were “a lie”. Zuma sympathisers said his statement that “some people may fight” during his interview hours before he stepped down was based on “nothing but the fact that he enjoyed a lot of grass roots support”, and that he wanted to travel the country with Ramaphosa to forge ANC unity. On February 18, four days after Zuma resigned, Ramaphosa went to Kimberley, where he thanked soldiers for “a bloodless leadership change”. Brigadier General Mafi Mgobozi yesterday said allegations of interference in political leadership were “baseless”. “As per the constitutional mandate, the SANDF is not in the business of interfering in the political developments of the republic,” he said, and added that the SANDF pledged allegiance to the Constitution and took direction from government, irrespective of who was in charge. POLITICISED Jakkie Cilliers, a senior researcher at the Institute for Security Studies, said he believed the problem with the army was “not politicisation”, but rather indiscipline. “I don’t consider the SANDF as factionally aligned or some type of threat to Ramaphosa, but it is certainly in need of a comprehensive overhaul,” he said. Cilliers said it was “inevitable” that the inclusion of politically aligned former liberation army soldiers into the SANDF would bring some political baggage. 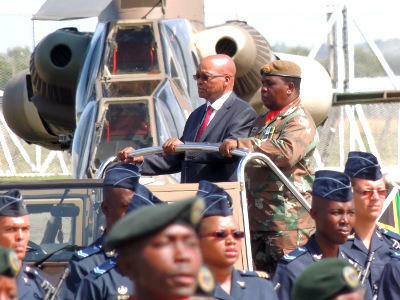 He added that Zuma appointed according to loyalty not competence throughout the security cluster – including the SANDF. Military analyst Helmoed Heitman said there was “some politicisation in the SANDF, and probably more of it in the army than in the air force or navy, but I do not think it is at a level where I would consider it a threat to the Constitution or the democratic order. I get the impression that, by and large, the officer corps is deeply unimpressed with all politicians, regardless of any former affiliations. “Most officers who entered the SANDF from Umkhonto weSizwe and the Azanian People’s Liberation Army seem to have long since shaken off their past politicisation ... [and] do not let their [political beliefs] get in the way of their duties. I am not at all convinced that the current senior leadership are all fans of our former president, or would step outside the bounds of the Constitution. And even if some of them might want to do that, I believe that they would find it very difficult to get any real support from within the defence force,” Heitman said.